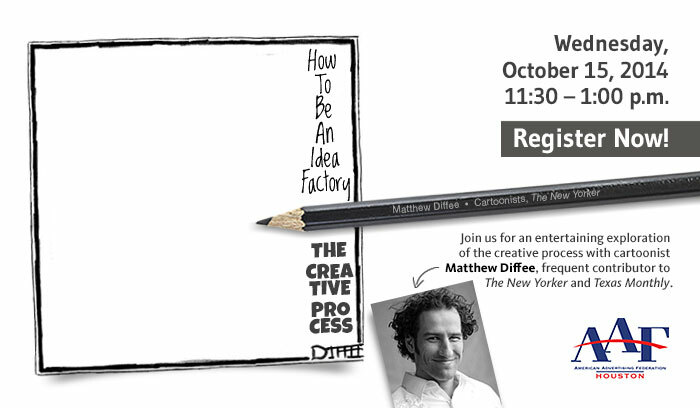 Matthew Diffee, whose cartoons you may have seen in The New Yorker and Texas Monthly, recently offered his views on idea generation and the creative process. He was in Houston presenting to the American Advertising Federation. Matthew, not unlike a lot of us in a creative industry, has a quirky sense of humor and sees things (or at least thinks about them) from a different perspective. This helps in generating ideas. One of the first things he believes in is to make it easy to “do ideas.” If you’re a coffee drinker, make sure you’ve got a fresh pot to start things off. Second, or at least this is what I jotted down as second, is a list of five verbs that he uses when he reviews his ideas: Add, Subtract, Switch, Invert, Mash up. These may lead to some sort of visual and/or a caption for the visual. The interplay between words and pictures can be fun! An example he gave of taking a traditional question oft times used in job interviews, “Where do you see yourself in five years?,” and, instead, coming up with “Where do you see yourself in ten minutes?”. Try that in your next interview. The best thing one can do is to maintain momentum – keep going in your process. I’ve learned from experience that stopping and starting does no good. You really have to get into some sort of flow. The Zone – easy to start, hard to stop. We’ve all found our “zone” before. Once you’re in it, don’t let up until you’ve got what you set out to get. Flip Funnel – large end to finely tuned. Seeing an idea in a broad sense and developing it to a specific angle or perspective. Going from concept to a single cartoon cell in Matthew’s case. Generating Ideas – quantity over quality. You can sort through these later. You need ideas and lots of them. Never critique when generating ideas. Can’t make a great idea just by working harder – inspiration hits like a turd. Though somewhat crudely put, his thought is true. We can’t plan to have a great idea by a certain time. It’s not like we have an On/Off switch. We may take five minutes or two days. Dull Bulbs – assume your work could be better. Don’t let your ego get in the way. No matter how wonderful we may think our idea is, there’s something about it that can be improved. So whether you’re a budding cartoonist, experienced writer or designer or someone who needs to come up with a bunch of ideas for the next mode of transport to Mars and beyond, some of these techniques may help. And when you review what’s been discarded at week’s end, don’t throw them away. Who knows what other uses may be made of them. Posted on October 28, 2014 by Joe Fournet	• This entry was posted in Creative Process, Creativity Tip and tagged AAFH, American Advertising Federation Houston, Cartoons, Creativity, Joe Fournet, Matthew Diffee, Texas Monthly, The New Yorker. Bookmark the permalink.